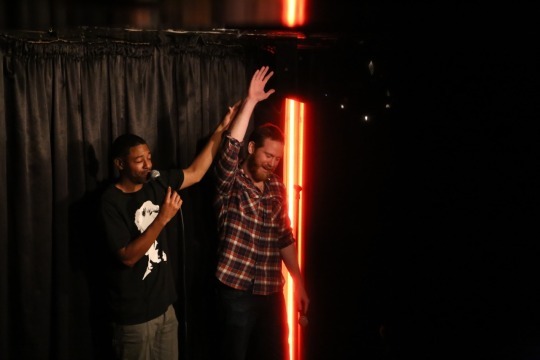 Last night provided more proof why Roast Battle really is the best show in town. Nearly two years in, it remains unpredictably raw, funny in a way that cuts straight to the bone like a fillet knife. 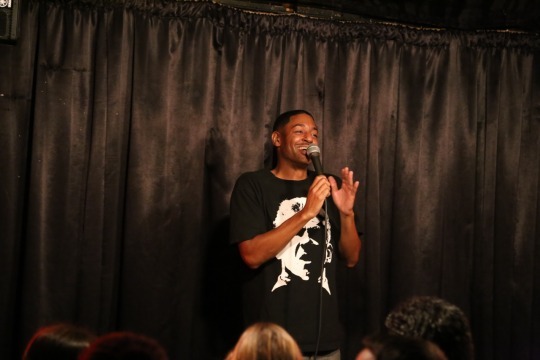 Every performer came at the top of their game, from the judges, to the All-Chicano Wave, to the infamous House Hater, and on to Brian Moses, the unflappable ringmaster of this circus. The show would be nothing without them, all tied together by the dynamic soundscape provided by Coach Tea. But the battlers are the real stars. No-name comics like the ones the Battle frequently showcases are the best kind of performers for this show. They have nothing to lose. If they know what’s good for them, they pull out all the stops, ready to show off their skills at writing the cruelest jokes. We’re ramping up for a big spring at the Roast Battle, and tonight’s show was the perfect first course before we dive into meatier battles at the end of the month. Our first undercard was a thinly veiled attempt at trying to make roasting a Special Olympics event. Keith Reza and Michael James Benson slugged it out in a battle not just wits, but also of Asperger’s vs. cerebral palsy. 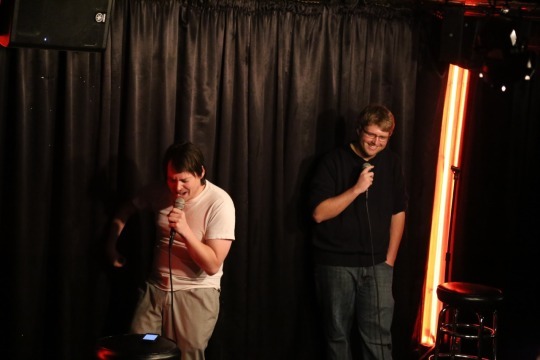 MJB came galloping out of the gate slinging Asperger’s quips without giving Keith a chance to respond, but Keith had some solid jokes lined up ready to knock MJB and his palsied arm for a loop. In the end, Keith “The Razor” Reza took down his physically-challenged foe, clearing the stage for our next undercard: Danny Jolles and Rob O’Reilly. 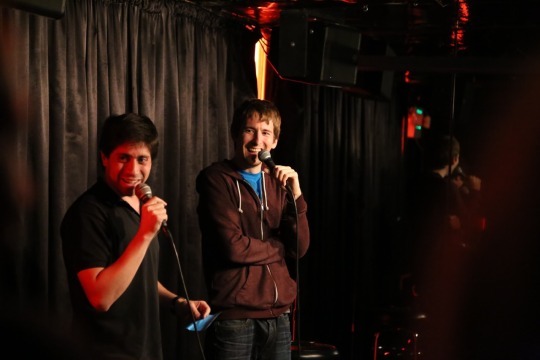 Danny seemed skittish from the start, letting everyone know how much he hated being in the Roast Battle ring before copping to the fact that he was mostly doing it because Rob was such a good friend. Rob, a producer for Ridiculousness, looked poised and prepared. But then these two newbie battlers opened their mouths and the storylines began to shift. 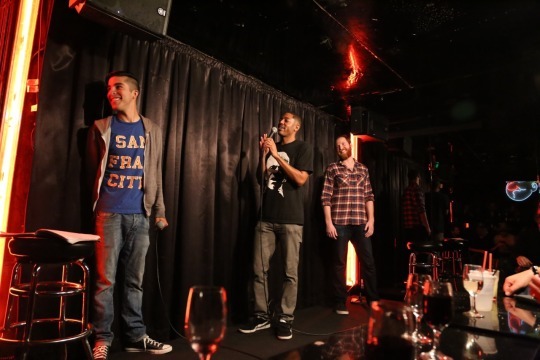 After a close call on the initial vote, Danny eked out the victory on a recount, though Tony Hinchcliffe said the round really belonged to Coach Tea for his spot-on sound cue after Rob’s DJ joke. After Pat Regan cleansed our palates with his mighty hilarious musical skills, the main event was upon us: Josh Waldron vs. Doug Fager. Things only escalated from there. Doug took the first round handily, winning on a final line that got the All-Chicano Wave on their pies. 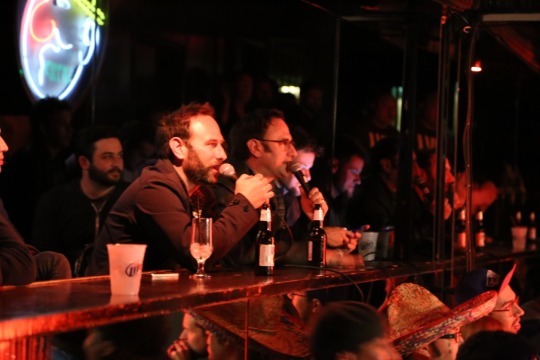 Things almost got derailed when an admittedly-high Theo Von declared the round a tie, but the Sklar Brothers got everything back on the right track. Ultimately, they decided it was best to give Josh the third round he had so clearly prepared for. Adam chose Josh to kick off the proceedings for the final bout of the match. He steeled himself. Every single one of Doug’s jokes landed, while Josh unfortunately had one blank in the magazine. The judges and crowd gave the battle to Doug. Josh fought hard, but in the end, the beard – and the jokes behind it – prevailed. I didn’t pick any winners last night. I think that’s enough of a sign for me to stick to battling. I’ll see you guys next week when I take on Stuart Thompson.